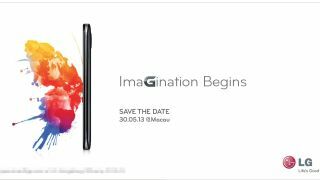 LG Optimus G2 launch set for May 30? Look at what's coming! Seriously, look - what is it? The 'next in the Optimus G line' is coming at the end of this month, with a 'Save the Date' invitation being whizzed out. The invitation shows a new slimline phone with colour bursting out of the screen, with a slightly protruding camera element on the rear. Although you can totally see all this in the invite above. However, there's a bit more going on here – LG has been promising to keep the screen wars going with Samsung with its new phone, and we're expecting, if this is the LG Optimus G2, to see a new level of IPS LCD technology used to provide even higher contrast ratios, brightness and resolution to the phone. This isn't nailed on yet though, as LG would only tell us that this was 'one of the Optimus G Series', which doesn't necessarily mean that it's going to be the Optimus G2, despite the South Korean brand talking up the new phone in recent weeks. It would be odd to see the Optimus G2 appearing so soon after the LG Optimus G Pro was announced, but if LG is mirroring Samsung's movements, then it makes sense that it would have a more premium smartphone line happening next to its larger, Note-style devices. Add to that the fact the Optimus G2 has leaked all over the shop, and you can see that it seems likely we'll be getting a taste on May 30 in Macau. It's not good news if you're highly excited for this phone though, as LG has told us that this phone is 'planned to launch in Asia' which would mean it would follow previous Optimus G release cycles and only come to the Asian continent, before getting a US launch and then dribbling into Europe. Still, we'll be reporting on all the events from Macau at the end of the month, so keep your eyes peeled to see what emerges.